Traktor Kontrol S2 Ama Music | Studio Gear, DJ Equipment, Musical Instruments, Pa Equipment and Lighting Online Music Store. TRAKTOR KONTROL S2 is the no-compromise 2-deck DJ system. Fully integrated with TRAKTOR DJ for iPad and iPhone – add tactile, physical control to your iOS DJ setup. Compact, mobile, and intuitive – the TRAKTOR KONTROL S2 is the essential 2-deck professional DJ controller. Perform with two channels, a pro-grade mixer and an arsenal of specialized DJ effects at your command. Or use your own samples to personalize your sound with Remix Decks.Fine-tuned for essential TRAKTOR PRO 2 control, TRAKTOR KONTROL S2 also pairs with TRAKTOR DJ for iPad and iPhone as the cornerstone of your mobile DJ setup. TRAKTOR PRO 2 is the choice DJ software of countless professionals worldwide. Get in-depth control of your music with up to four software decks, customizable interface, and advanced track library management. Sync tracks to one another for flawless beatmatching. Or unleash your creativity – TRAKTOR PRO 2 comes armed with a spectacular creative arsenal and absolute flexibility. Take the party with you. 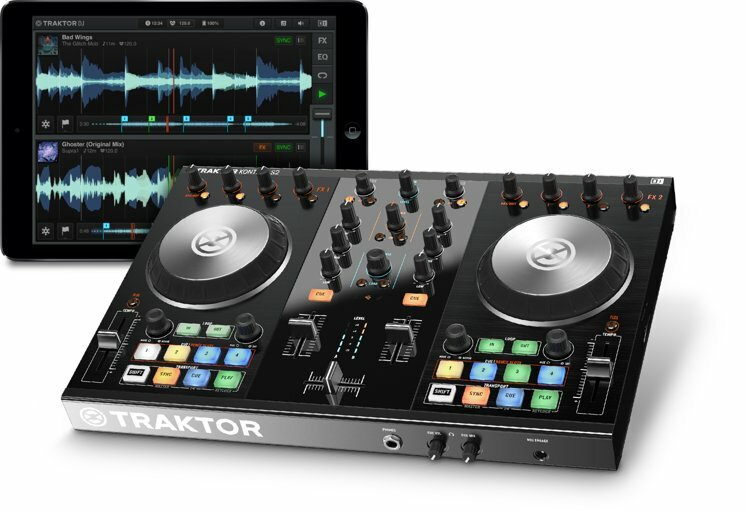 TRAKTOR KONTROL S2 is ideal for iOS DJ setups with TRAKTOR DJ for iPad and iPhone – the world’s favorite pro DJ app. Touch the groove and deliver instant, high-impact DJ sets using hand gestures you already know. Rugged and portable, TRAKTOR KONTROL S2 is ideal for both new and seasoned DJs.